In Chuck Jones’ hands, the Daffy Duck of the 1930s and 40s–loopy, zany, whooping loudly, flipping out–went through a bit of a personality overhaul in the 50s. The zaniness was still there, to be sure, but this Daffy was much more calculating and jealous, more prone to fits of rage than crazed lunacy. The change wasn’t completely out of the ether, as there had been indications of this aspect of the character in previous incarnations–for example, in the 1940 black-and-white live-action/animated short You Ought to Be in Pictures, Daffy schemes to get resident star of the time Porky Pig off the studio lot so he can take his place as the headliner for Warner Bros. [Incidentally, this cartoon features a brief on-camera appearance by Chuck Jones, as well as fellow Warner director Bob Clampett and Jones’ longtime writing partner Michael Maltese. Definitely a curiosity, definitely worth viewing!] But most animation directors at the studio tended to focus on Daffy’s … well, daffier qualities over his more ambitious traits. Starting in the late 1940s, Jones took that somewhat repressed ambitious side of Daffy and brought it to the forefront, engaging the character in an outright rivalry with Warner’s tried-and-true superstar, Bugs Bunny. To Jones, though, it wasn’t just about turning Daffy into an adversarial character; as he recounts in Chuck Amuck: The Life and Times of an Animated Cartoonist (1999), he always viewed Daffy more as a “self-preservationist” than a truly selfish character. Jones’ philosophy regarding Daffy was that the character’s avarice and self-absorbed nature are universal traits that everyone who watches his cartoons will recognize–and one that he saw even within himself: “Daffy gallantly and publicly represents all the character traits that the rest of us try to keep subdued. A social amenity to Daffy Duck is simply an unfair block to his desires. To desire, in Daffy’s rationale, is to need–as it was to me at six; to need is to acquire, and acquisition is the essence of living. To achieve his ends, he cheerfully and always rationally chews up moral codes by the yard.” And yet Daffy’s self-important self-service is never off-putting, in part because we, the viewers, are so easily able to relate to him, at least on some level. It’s a delicate balance to maintain, but Jones and crew adeptly portray their Daffy as both frustrating and endearing, “dethpicable” and lovable all at the same time. 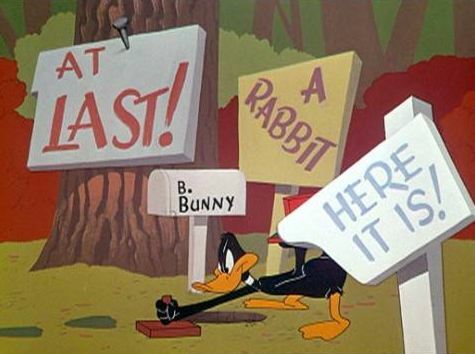 Jones’ version of the character really lets loose in three popular and ultimately influential cartoons (all written by Maltese) that are familiarly known as the “Hunting Trilogy”–Rabbit Fire (1951), Rabbit Seasoning (1952), and Duck! Rabbit, Duck! (1953). 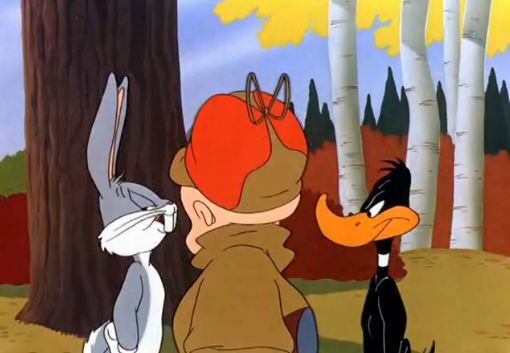 These shorts feature Bugs and Daffy squaring off with Elmer Fudd, who is determined to shoot one or both of them–if he can only figure out which “hunting season” it really is. 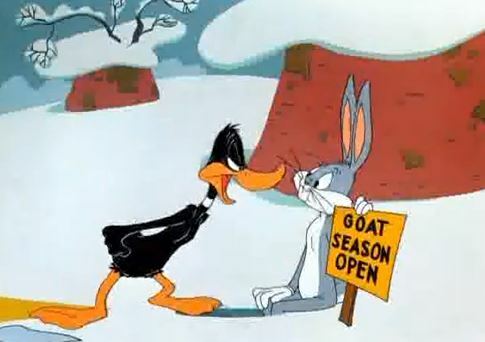 Daffy continually tries to throw Bugs into harm’s way–whether to protect himself (because it’s really duck season) or to cause trouble for his rival in the midst of rabbit season. Bugs, for his part, manages to skirt out of that trouble at every turn, usually at Daffy’s expense, while Elmer essentially stands around waiting for his cue to fire. The result of all of this madness is a trio of witty, entertaining cartoons that set up a winning dynamic of co-mingled friendship and rivalry between Bugs and Daffy that remains a vital ingredient of their animated relationship to this day. The first cartoon of the trio begins as previous Bugs-and-Elmer cartoons have begun: Elmer creeps through the forest with his rifle, pausing to shush the audience with his familiar catchphrase, “Shh! Be vewwy, vewwy quiet. I’m hunting wabbits. Hahahahaha.” There is a brief flash to a shot of Bugs’ feet leaving tracks on the forest floor, which Elmer quickly discovers, and we soon discover that “Bugs” is actually Daffy, wearing a pair of bunny slippers (so to speak) to draw the hunter to Bugs’ hole. Daffy’s reasoning behind his deviousness? “Survival of the fittest,” he snickers, adding with a couple of his trademark hoots, “And besides, it’s fun!” But Daffy’s shenanigans are turned around on him when Bugs catches on to his scheme and neatly turns it around on his feathered nemesis. Rabbit Fire (like its two successors) is somewhat unique for Warner Bros. in that it relies heavily on the wordplay and dialogue (the infamous “rabbit season”/”duck season” exchanges) between the characters instead of the wild action associated with most of the studio’s shorts. As the first cartoon to feature both Bugs and Daffy in starring roles, it might be expected that one or both characters would be short-changed in some way to make room for the other; instead, they are given equal stature–though to me, at least, Daffy is the true focus of these shorts (if anyone comes off as a third wheel here, it’s Elmer, whose only function is to provide the catalyst for Daffy’s punishment). The formula for the characters’ future encounters is pretty much set: Bugs is the wiseacre winner, and Daffy is the defiant loser. The scene is marked by a brilliant delivery by voice actor Mel Blanc that fully demonstrates the depth of Daffy’s frustration. This is a duck that is ready to snap (which he does, eventually, by the time the third installment in the series rolls around). The second cartoon of the trilogy is my personal favorite (as it appeals to the grammar nerd in me). It opens with a multitude of signs pointing the way to Bugs’ rabbit hole. Daffy appears, once again forging rabbit tracks in the ground to entice Elmer further. His motive this time is similar to the previous cartoon: “Awfully unsporting of me, I know, but what the hay–I gotta have SOME fun! … And besides, it’s REALLY duck season!” Once again, however, Daffy’s grand scheme falls apart as Bugs escapes danger and Daffy endures a series of indignities. The cross-dressing trope reappears–this time without Daffy’s involvement in the charade–and, as in Rabbit Fire, this one has a great ending. Rabbit Seasoning demonstrates the tenaciousness of Daffy’s 50s persona–even when he knows that he’s in too deep (exclaiming, “Not again!” when he realizes he’s about to be shot once more)–he cannot let it go and move on. He is forever trying to win, and forever losing to someone cleverer than he, and the frustrating cycle just goes on and on with little relief. It’s somewhat reminiscent of the situation with the (non)performing frog in Jones’ masterpiece One Froggy Evening (1955), in that Daffy’s constant striving reflects an inescapable sense of futility from which he cannot extricate himself–and in the end, it’s yet another way in which the character is made more relatable to the audience, because who hasn’t been there? In many ways, it’s the very nature of human existence, encapsulated in a six-and-a-half minute cartoon. Incidentally, Rabbit Seasoning is the only one of the “Hunting Trilogy” to have been voted onto the list of the 50 Greatest Cartoons–it ranks at number thirty (it’s worth noting, however, that its predecessor was given an honorable mention on the list). The conclusion of the trilogy changes the scene to the midst of winter, but otherwise follows the same formula as the first two: it’s the middle of duck season, Daffy is “a duck bent on self-preservation-um,” and thus he tries in vain to convince Elmer that it’s actually rabbit season, with old pal Bugs as the target. But this time, when Bugs turns the table on him, both Daffy and Elmer eventually lose their ever-loving minds. Bugs immediately holds up a sign reading, “Dirty Skunk Season,” and Elmer fires. The ending of Duck! Rabbit, Duck! employs some seriously dark humor, as the other two characters crack under the pressure of dealing with the unconquerable Bugs. 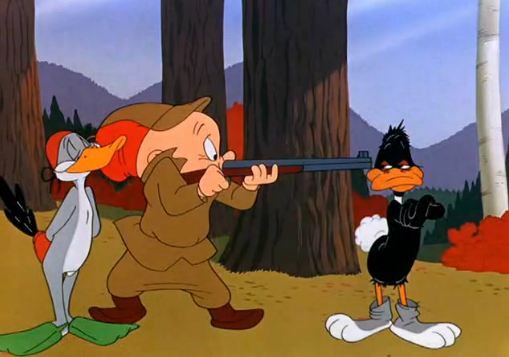 First, Daffy loses his marbles–understandable considering he’s been shot in the head multiple times and lived to tell about it (kids, don’t try this at home)–and demands that Elmer shoot him again and again and again: “Shoot me again! I enjoy it! I love the smell of burnt feathers and gunpowder and cordite!” Soon after Daffy’s breakdown, a frustrated Elmer also succumbs to the madness after three years’ worth of go-rounds with the zany pair. When a disguised Bugs informs Elmer that it’s actually BASEBALL season, something snaps in the hunter, and he sets off chasing a baseball over the snowy hills, shooting it gleefully as he runs. And even after Elmer runs off and Daffy comes back to reality, Bugs still manages to get in one last shot (literally) at Daffy. The rabbit’s victory is nothing short of complete. Together, the three cartoons that make up Chuck Jones’ “Hunting Trilogy” are undeniable classics of the animation genre. Not only are these shorts absolutely hilarious, but they are intelligently composed, with an attention to dialogue and detail that was far from the norm at a time when action shots and slapstick gags reigned supreme. And while these cartoons feature their fair share of physical humor, it’s the verbal interactions between the characters that really drive the action and make these such memorable entries not only in the career of Jones, but in the history of animation itself. September 21, 2012 in animated shorts, animation, brandie's faves, classic cartoons, hahas, kiddie faves. Tags: chuck jones, michael maltese, warner bros.
OMGoodness I loooooved these!!! This has just totally taken me back to when I was a little person! I have to admit that my sympathies were always with Elmer Fudd, the poor slob. But in this “Hunting” series, I really feel for Daffy Duck. In an interview once, Chuck Jones described the Coyote/Road Runner cartoons as “an exercise in the mechanics of self destruction”, and this certainly applies to poor Daffy’s dilemma in the hunting trilogy as well. It’s a recurring theme in much of Jones’ work. Just as the Road Runner has no real desire to hurt the Coyote, Bugs has no real desire to hurt Daffy, and in each case, it’s only necessary for each to patiently provide enough rope for the other to bring destruction upon himself. One of my favorites running gags in the Hunting Trilogy is that every time Daffy is shot, he winds up wearing his bill sideways, or upside down, or backward, and needs, to his embarrassment and indignity, to reset bill position before the action can continue. Very Chuck Jones, and absolutely priceless. Also, in the the recipe showdown: A rabbit dinner recipe includes something called “cottontail sauce”, yum yum [laughing]. Man, that is just sheer genius. Speaking of which, yes, it’s Chuck Jones directing, but these masterpieces– all of them– are scripted by his constant collaborator Michael Maltese. I suspect that, like with the Coen brothers, the collaboration ran both ways, with Maltese and Jones both contributing to visuals, direction and dialog. So, shout out for Michael Maltese, unsung hero. This is your celebration too. I’ve just been reminded by a friend: It’s “Hunting Twilogy” [laughing]. Girl knows her WB animation, and I stand corrected. These are my favorite Looney Tune Cartoons! I know them by heart & randomly recite lines from them! 🙂 Very well written. HUGE Looney Tunes fan I am and this is simply wonderful! Thanks so much for dedicating these posts to the magic and legendary talents responsible for these great works of art.